I have very little free time, or at least it feels like I do, what with a career that can eat up both hours at work & at home, as well as an almost-three-year-old about the house. But, sometimes, when I do get a bit of time, I'll grab a beer-reIated book, and try to boost the beery brawn of my brain. 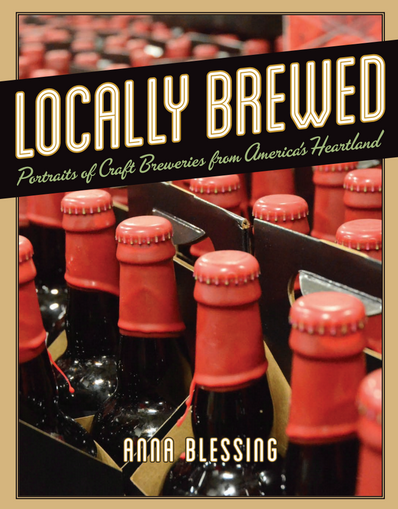 Locally Brewed, by Anna Blessing, is an interesting & casual read that's easy to pick up & put down in short sessions. In it, you'll surely learn about some of the beers brewed in the midwest of America, but the uniqueness of this book lies in its real focus, which is the people & places behind these beers. You will learn about the beginnings, challenges, and successes of 20 breweries like Bell's, Three Floyds, and Jolly Pumpkin. You'll find lists of the best local places to grab a pint of these breweries, like New Glarus, Great Lakes, and Founders. You'll learn some info on brewery setups / size, & things each company's learned along the way (like how most of them wish they'd started out bigger). One of my favourite parts of the book, that I think was pure genius, is the inclusion of brewers' playlists. For whatever reason, I would argue that those in craft beer are more deeply into music than the average citizen. Seeing their choice of at-work tunes is a neat look inside of their work environments and minds, a bit of insight into what kind of gals and guys are making these brews. Locally Brewed is a great read; an enjoyable and insightful book that you can pick up and read any part of in any amount of spare time that you may happen to have.